ALLENTOWN, New Jersey, May 29–Ashley Holzer doubled up with victories in both the big and small tours at the Memorial Weekend Dressage CDI3* Saturday, but for the second straight day Lauren Sammis and her Pan American Games gold medal horse, Sagacious HF, showed they were back in form. The three-time Olympian and four-time World Equestrian Games rider for Canada, won the Grand Prix Freestyle aboard Pop Art, a 14-year-old KWPN gelding, with a score of 74.085 per cent with Lauren and Sagacious second on 70.140 per cent and Canada’s Gary Vander Ploeg on Degas third on 66.800 per cent. Ashley and Pop Art won the Grand Prix Friday. The Grand Prix Special was won by Melissa Taylor of Wellington, Florida on Schumacker Solyst with a score of 65.792 per cent with Gary Vander Ploeg on Cezanne second on 63.104 per cent and Alex Robertson of Coatesville, Pennsylvania, on Santos Utopia third with 62.917 per cent. Ashley, who lives in nearby New York City, followed up Friday’s Prix St. Georges victory on Ultiems Flemming, a 10-year-old KWPN gelding, with the win on a score of 72.982 per cent in the Intermediaire I Saturday. 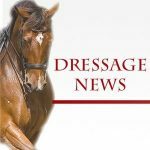 Endel Ots of De Pere, Wisconsin, on Toscano was second on 69.430 per cent and Silke Rembascz of Flemington, New Jersey, on Bulgari 5 third on 69.342 per cent. Ashley said a decision has not yet been made on whether she will seek to compete in the Canadian selection trials for a place on the team for the Pan American Games that is at small tour and is scheduled for Guadalajara, Mexico in October. Lauren Sammis of West Orange, New Jersey, said that Sagacious was “very, very well behaved” in his first international competition in a year. The footing was exceptionally deep that was fatiguing for all the horses but, she said, the 12-year-old black KWPN gelding owned by Hyperion Farm handled it well. 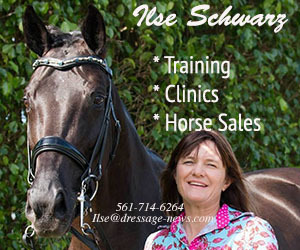 “The comments from everyone was that Sagacious looks stronger and better than ever,” she said, adding that the judge, Axel Steiner, noted the horse appeared to be the best since starting Grand Prix after the 2007 Pan American Games where they won team gold and individual silver. The horse will get some down time before heading to Canada to compete later in the summer. Lauren, who has worked for years with Ashley Holzer, joked that she is getting a little tired of hearing the Canadian national anthem at the awards ceremonies. “Anything you can do I can do better,” Lauren told her as they stood together . “She’s the one person I wouldn’t mind being beaten by,” Ashley retorted. The first competition appearance of George Williams and Riccidoff, a 6-year-old stallion that was the 2010 Hanoverian vice riding horse champion, drew lots of attention. Riccidoff, (Riccione x Don Davidoff x Sandro Hit) bought at the PSI auction last December by Betsy Juliano of Havensafe Farm in Middlefield, Ohio and Wellington, Florida, scored 73.800 per cent in the FEI test of Choice.